Casa de Lamas is a manor house built in the last quarter of the 17th century, with a large agricultural estate. Since its construction, the house has remained in the same family and has been entirely restored some years ago. Traces of different architectonic styles have been preserved during the restoration. There are two 1 bedroom villas, 1 two bedroom villa and 1 three bedroom villa for rental. All the villas are comfortable and well furnished. Guests from all villas share use of the gardens, swimming-pool and tennis court. The two bedroom villa, called Quinteiro Villa, has two floors. On the lower floor there is a living room with television and games table. The kitchen has a four ring electric hob, fridge and microwave. On the upper floor there is one twin bedroom with private shower room and one double bedroom. The twin bedroom can take an extra bed. There is also a living room with a sofa bed and a shower room. The Adega Villa has a twin bedroom with bathroom, a living room with television and games table and a kitchenette with a two ring electric hob, a fridge and a microwave. The Lagar Villa has a living room with television and games table and a kitchenette with a two ring electric hob, fridge and microwave on the lower floor. On the upper floor there is a double bedroom with bathroom. This cottage can take two extra beds. The Alambique Villa has one double and two twin bedrooms, 2 bathrooms, dining room and living room with a television. The kitchenette has a two ring electric hob and a microwave. This 3 bedroom villa has private garden, terrace and barbacue. In the property of Casa de Lamas there is a room containing a remarkable collection of farm artifacts featuring hollow tree trunks used in the past to store cereals. The swimming pool is in a lawned area, measuring 12 by 6 meters with the depth varying from 1 to 1,7 meters. The tennis court is in a wooded area approximately 50 metres away from the main house. Casa de Lamas has a 3 hole golf course. The golf academy with dressing room and club house will be soon available. 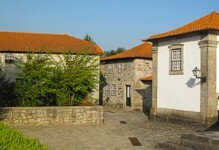 The Port wine producing area is approximately 2 hours drive away and opportunity should be taken to visit the historic centre of Guimaraes, which has UNESCO world heritage status. Further north west is the interesting town of Braga, the ecclesiastical capital of Portugal. Bom Jesus do Monte is one of Portugal’s most spectacular religious sanctuaries. The nearest restaurant is about 150 meters from the property. Amarante golf course is about 50 kilometers away.